Start your day with a breathtaking view of Chicago and a hearty breakfast on a glass-enclosed balcony 103 stories up! Ascend to the Skydeck of Willis Tower, the tallest building in the western hemisphere, and take your seat at a breakfast table 1,353 feet (412 meters) above the ground. Choose from five full breakfast menus and savor your meal for a leisurely 1.5 hours before the tower's Skydeck opens to the public. Afterward, browse the Skydeck's interactive exhibits about Chicago's history and culture. This awe-inspiring experience is perfect for both first-time and return visitors alike! Note: You must add your breakfast selection at time of checkout in the special requirement field. 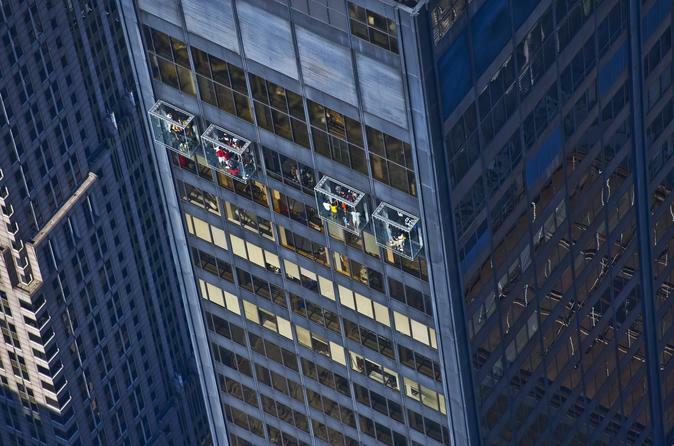 At Chicago's Willis Tower, ride an elevator 103 stories up to the Skydeck before it opens to the public. You'll be escorted out to the Ledge, a series of four glass-enclosed balconies 1,353 feet (412 meters) above the ground. Take a seat at your table in one of the balconies and marvel at the phenomenal views of the Chicago skyline. Capture your share of photos from your incredible vantage point in the tallest building in the western hemisphere. Indulge in your choice of five hearty breakfasts packed with pastries, fruits and eggs (see Itinerary for sample menu), enjoying your meal during a leisurely 1.5 hours. Feel like royalty as you survey the hustle and bustle of the city far below. After your amazing breakfast in the sky, browse the many interactive exhibits on the Skydeck. Watch a short film about Chicago's rich architectural heritage, learn about the city's history and culture through a trivia game, and admire the mesmerizing views until you're ready to go back down and continue exploring the city. Note: Please make your breakfast selection at time of checkout.